I wish I could invite every single one of you over. We’d sit outside on my vintage turquoise glider and chat and laugh while my hubby manned the barbecue. 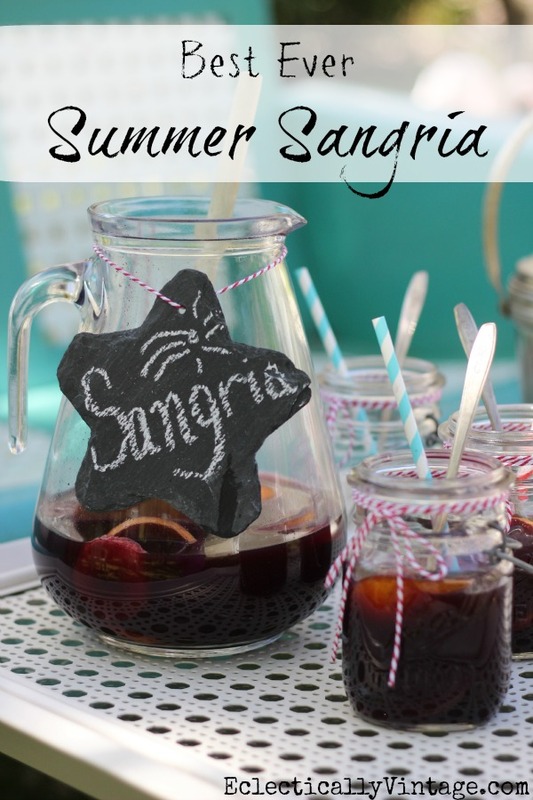 I’d serve you my favorite summer sangria recipe and you’d beg to know how I made it. Ever notice how the best recipes get passed down from friend to friend? My friend Brian is very serious about his sangria recipe and concocts giant vats of it in his basement. Once I tasted this liquid gold, I begged him for the recipe and now I’m passing it along to you since that’s how I roll! Don’t let the list of ingredients scare you – they all come together to create the perfect balance of dry and sweet that you will love! Mix all ingredients together and let marinate in the fridge for 24-48 hours. 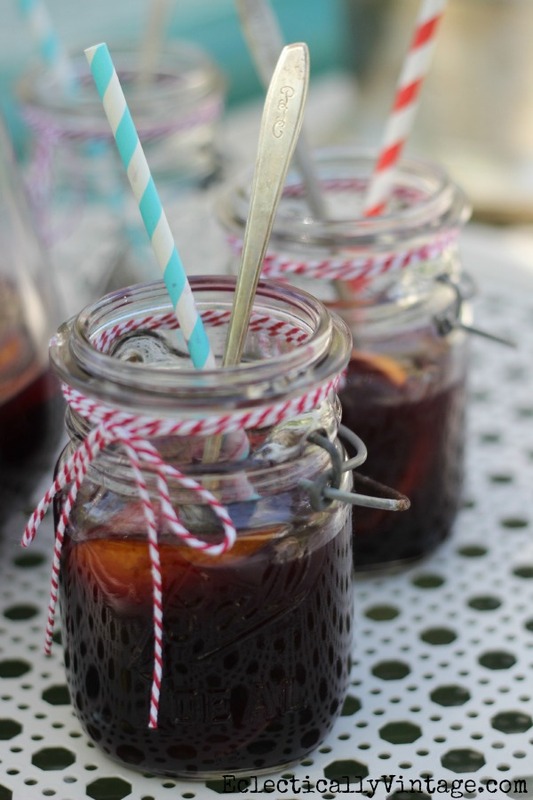 I’m raising my sangria filled mason jar to you and toasting to your health and happiness! Check out more of my favorite simple recipes here. I love that this has a little white wine in it, too. I’m not a big red wine drinker, but I DO enjoy a good sangria! Pinning! Pinned. Need I say more? OH MY GOODNESS!!!!!! This sounds amazing! I wish I would of seen this 48 hrs ago so it would of been marinating so I could of taken some to the beach today…oops…is that bad??? 🙂 Thanks so much for sharing I have a couple of recipes for Sangria but none with this combo of ingredients!! Can’t wait to try some. You know I’m going to have to test this out!! My kind of recipe! Love it and pinning it to try soon! i may have to test this out this weekend! I need one now! Packing up my kitchen for the reno, so busy like crazy! Thanks! Yum! Sounds sooo good! This will be a nice change from the peach sangria I usually do. Thank you for sharing! OMG I can’t wait to try. This sounds amazing! Pinned it, and am headed to the store tomorrow! Glad I found this. I was just saying I wanted to make some good Sangria. Can’t wait to try this. I am a new follower. Have a fabulous weekend. Ohhh, looks sooo good – cheers! I am soooo in!! Looks lovely! Yes, please. I will have a birthday pitcher of that right NOW. YUM. Pinning! 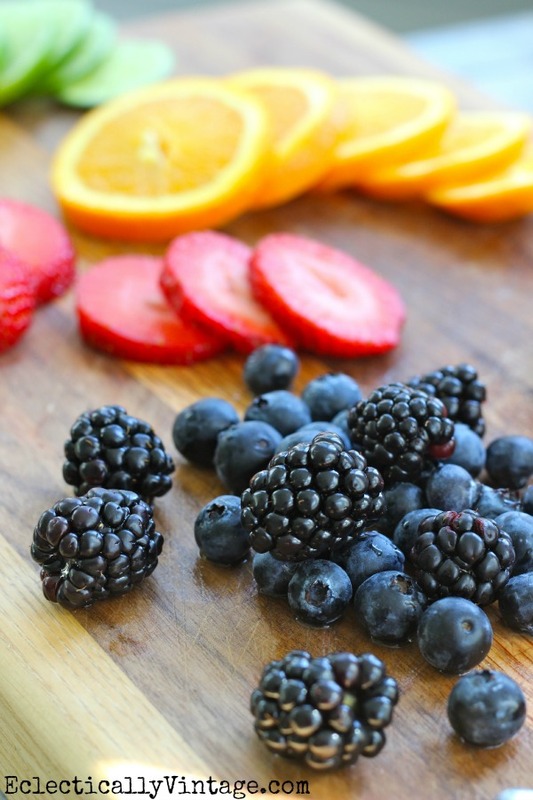 Oh, and the photos in this post are gorgeous…especially the one with the fruit! Looks and sounds terrific!…just in time for my “mexican buffet” dinner party!!! We’ve been making very simple Sangrias this summer. Just sweet white wine and fresh mashed fruit, over ice. But the many ingredients in this one makes me really wonder how it tastes. I’m betting on AMAZING! Pinning, to mix some up for ourselves! TFS! P.S.- L O V E that fruit shot! 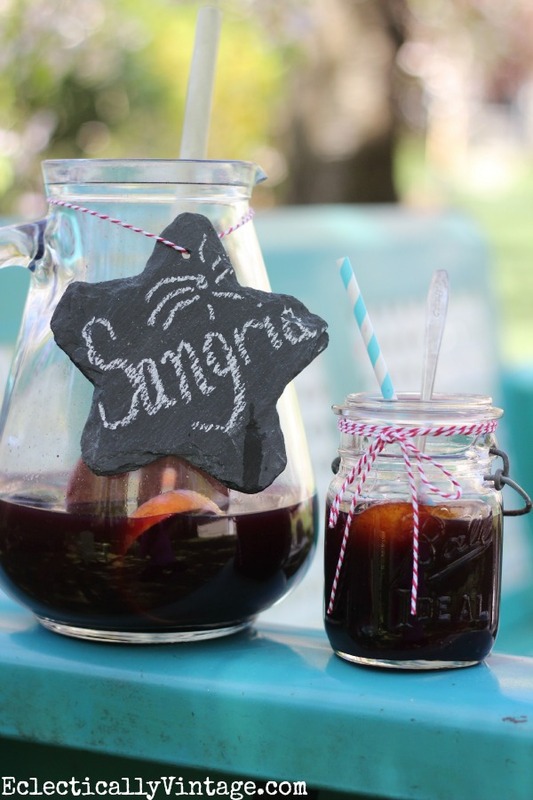 Love your sangria recipe Kelly!! Sangria + Havaiannas = SUMMER!!!! LOL! Can’t wait to meet you at Haven girl! Ooh I love sangria! And this looks like a great recipe, pinning for sure! I’m stopping by to let you know I featured this on my blog today as part of a roundup of 25 Refreshing Summer Cocktails! Feel free to stop by and grab a Featured button if you’d like, and thanks again for the great recipe!